How many times were you faced with a challenge to do a job of editing a Portable Document File (PDF)? It could be a need for you to put a comment on a PDF file emailed to you or a customer wants you to fill-up a PDF form and resend afterward. Our usual way of doing the job could be download the file, print a copy, do what needs to be done manually (put the comments or fill-up the form by our own handwriting), scan the accomplished job and send back the image. Another way could be convert the PDF file to a Word or Rich Text File (RTF), edit the converted file and convert again to PDF before sending back. These methods are not only laborious, they may also give you the desired result. Lately, I was faced with a similar challenge while doing the documents for the Second Mindanao Internet Café Associations Summit (2nd MICAS). 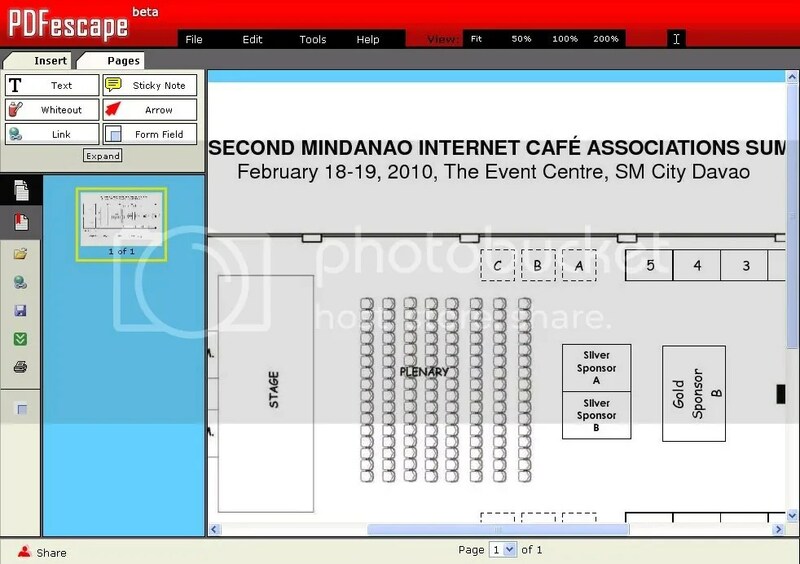 I had to edit the PDF copies of some documents regarding the exhibit booth specifications and started by converting the file into Word documents but I immediately noticed that the resulting editable file was not exactly the same as the original PDF documents. That being the case, I abandoned the procedure and searched the web for alternative free software to do the job and I found the PDFescape, an online PDF editor, form filler and viewer that satisfies my need. You have to register an account with PDFescape to be able to use its free online service. Aside from being able to edit PDF documents for minor changes like adding text, shapes, whiteout and sticky notes, you will be able to save your work online if you have an account with them. You can also use PDFescape to fill out PDF forms using existing form fields, a job that may otherwise require a download and manual fill-out. PDFescape is really a very useful tool for minor editing of PDF documents especially if you aim for a paperless activity.